It is November 1st so our stitch-a-long has officially started. Thank you to all who are sharing this journey with me. In the lead up to this month we have discussed stitch paths and how we would be stitching this band. Please share your progress and experiences. We are learning from each other. If anyone needs help please email me. A Sneak Peak of the model for a sampler reproduced and being stitched by Sandra for Hands Across the Sea Samplers. I posted this photo on the weekend which shows the vibrant blue found on the original sampler. It is quite amazing that the colour is so strong centuries (1656 !!) after it was dyed. The dye most probably used was woad. Since ancient times, woad was an important source of blue dye and was cultivated throughout Europe, especially in Western and Southern Europe. Woad was not used only for textile dyes and, for example the illustrators of the Lindisfarne Gospels (late 7th/early 8th century) used a woad-based pigment for the blue. In medieval times there were important woad-growing regions in England, Germany and France. Towns such as Toulouse became prosperous from the woad trade. The blue threads in the Bayeux Tapestry were dyed using woad and the blue in the tapestry is the only colour not to have faded in more than 900 years. The dye chemical extracted from woad is indigo, the same dye extracted from “true indigo”, Indigofera tinctoria, but in a lower concentration. When woad leaves are harvested, in July and September, they are washed and heated in hot water for several minutes. The blueish water is then mixed with chalk and left to settle. A blue paste is left after the water is poured off and this, when dry, can be ground into a fine powder to be used in paints, dyes and ink-making. Clothes dyed with woad indigo at first appear yellow, but as they dry they turn green, then turquoise then finally deep blue. Although woad has not been grown in the UK commercially since the 16th century, it was produced in Lincolnshire during the 1920s and 1930s to provide dye for Royal Air Force uniforms, before the adoption of synthetic colourings. I was asked yesterday about preparing linen. Many of you will have seen this video before but for those who have not you might enjoy watching. The tips given are all simple ones but they are important. There is a bonus clip at the end about Jane Vaughan, a beautiful band sampler. Finishing stitches where there is no laid stitch to hide them AND a BONUS clip at the very end. A sneak peak of a gorgeous and vibrant antique sampler that HATS will be reproducing. PLEASE NOTE: there is a difference in visibility between the two pin stitches. The one that the needle has split the laid stitch on the front is a much better finish. The other one has pushed the laid stitch to the side. Practice and play around with how your manipulate your needle. This is nit picking but there is a slight difference that I feel is worth going the extra to achieve. A beautiful piece of of First World War embroidery has been discovered in chest of drawers in Stoke-on-Trent. It was created by soldiers in 1917 to help them get over their experiences in the trenches. Hands Across the Sea Samplers are thrilled to present to you our latest reproduction – the beautiful Esther Benson 1739. Nicola was commissioned by Kimberley Young to reproduce a sampler exclusively for Sassy Jacks Stitchery. This is a particularly beautiful and unusual sampler both for the scenes portrayed and the colours used. Nearly two hundred and eighty years ago a 9 year old girl put the last stitches into her sampler recording “Done by me Esther Benson aged of 9 year 1739 at London”. The second pictorial band of Esther’s sampler is symmetrical in design and features 2 angels with trumpets, signifying that they are the voice of God, above a domed ecclesiastical building that is flanked by two oversized shrubs. It is in this building that the sampler shows its age and there has been thread loss. When we first saw this temple we initially thought that it was connected to Solomon’s Temple. However, this was to change when another sampler came into our collection that had the same building. This sampler’s near identical building bore a name – “The Temple of Fame”. After extensive research , we found that there was no connection to Solomon’s Temple and that our Temple had its own very interesting story that travels down the centuries. The story of the Temple of Fame goes back to 1379 when Geoffrey Chaucer, known as the Father of English. The model was exquisitely stitched by Suzanne Sirotti in Australia. We had great fun working with Kimberley on this project. Esther’s 32 page booklet booklet has much historical information. When researching her we were whisked back to a fascinating period in the history of London and we hope you enjoy the journey back in time too when stitching Esther. A comprehensive online workshop is also available through Sassy Jacks Stitchery. I will not be setting up a separate Facebook Page but will post each month in Our Samplers Years and the HATS Facebook page and the HATS blog on our website. AVAS d’Alger & a 100/3 conversion for higher counts of linen. I am so thrilled to present to my stitching sisters my finish of the reversible band sampler “Bathya” (you will need to click on the photos for them to open fully). Every single stitch has been a joy. To achieve a truly reversible finish much thought and planning has had to go into each band. It has been like a jigsaw puzzle. A brain challenge !! However, once the stitch path was worked out my needle flew. Bathya is a very special sampler with an amazing history -please see this video where Witney Antiques talk about the sampler shortly into the film. She is also featured in many reference books. Would you like learn how I stitched Bathya? I will only be teaching Bathya on three occasions – the first in November at Fobbles in Cumbria, England. As soon as the workshop was announced it was immediately oversubscribed so I will be running a back to back workshop. There are a handful of places left on Monday/Tuesday, November 4th/5th, 2018. Contact Beverley Trembath sooner rather than later if you are interested in attending. The only other occasion I will be teaching Bathya is on a visit to the US probably in June 2019. This will be at Sassy Jacks Stitchery and The Attic Needleworks. Bathya stitched her sampler with 15 vibrant shades of silks, ingeniously devising stitch patterns and motifs. These colours are taken from the front !!! There is so much to delight in her sampler. She used a wide repertoire of stitches of varying intricacy. The stitches include two different versions of reversible cross stitch; one forms a cross on the reverse with a vertical stitch on the left and the other a four sided stitch on the reverse. She also used double back stitch and diagonal double back stitch. These stitches appear plaited from the front and as two parallel rows of back stitch on the reverse, you might know them as closed herringbone. Other stitches used were double sided Italian stitch; alternating double back stitch in groups of three, which represents the Trinity; detached buttonhole; french knots and satin stitch. Bathya’s whitework bands are particularly elegant. Narrow whitework bands were an important part of a stitcher’s repertoire, they were used on collar bands both as an adornment and as stiffening so that the collars would stand proud. I will be at Sassy Jacks Stitchery in North Carolins teaching three x 2 day workshops on August 16/17, 18/19 & 21/21. This informal “off the cuff” video talks about the sampler and the workshop. There are 1 or 2 places still available. The Victorian era, 1837-1901, is characterised as the domestic age par excellence, epitomised by Queen Victoria, who came to represent a kind of femininity which was centred on the family, motherhood and respectability. Accompanied by her beloved husband Albert, and surrounded by her many children in the sumptuous but homely surroundings of Balmoral Castle, Victoria became an icon of late-19th-century middle-class femininity and domesticity. Indeed, Victoria came to be seen as the very model of marital stability and domestic virtue. Her marriage to Albert represented the ideal of marital harmony. She was described as ‘the mother of the nation’, and she came to embody the idea of home as a cosy, domestic space. When Albert died in 1861 she retreated to her home and family in preference to public political engagements. Queen Victoria was a supporter and promoter of embroidery and domestic crafts. There is a very interesting video on Royal baby clothing at the Museum of London that includes a pair of shoes that Queen Victoria embroidered. Following Victoria’s lead the middle and upper class ladies devoted much of their time to needlework which had evolved from a craft to a feminine accomplishment which signified gentility. Idleness was considered frivolous and profitable use of a lady’s time was morally important. Fancywork was a display of genteel industry. In the 19th century the creation and giving of a handmade gift was the ultimate expression of feminine arts and an important ritual. Queen Victoria’s childhood diary notes that she gave a pin cushion to her governess and and received a pincushion from her maid. When she became Queen she continued to make needlework gifts. All her daughters handmade gifts for family birthdays and Christmas. The Lady’s Manual of Fancywork (1859) lists suitable items for presents. A pdf of the BOOK is available to view. Today in the age of commercialism when stores are constantly promoting gifts for one holiday or another it is easy to overlook the importance of the homemade gift.The pleasures of giving and receiving homemade gifts are many. They are a gift of affection, imagination and creativity. Gifts that show time was put into them are the most meaningful. I had great delight this weekend to open a surprise package that contained a pin cushion that has been exquisitely cross stitched. Much thought and time had gone into creating the cushion and it will be treasured as a token of affection. All well-bred Regency ladies aspired to be highly accomplished. They painted tables, covered screens, and netted purses as Austen’s character Charles Bingley matter-of-factly describes in Pride and Prejudice (among other talents), all to allure and secure husband. If you visit an English Church you are sure to see hand embroidered kneelers a plenty made by the good ladies of the parish. These kneelers are stitched in wool yarn with a style of embroidery known as Berlin wool work “BWW” – a style of embroidery similar to needlepoint. The two most common stitches found in BWW are cross stitch and tent stitch although Beeton’s book of Needlework (1870) describes 15 different stitches for use in BWW. Coloured beads are sometimes added to accent a design. An interesting stitch used in BWW is the Surrey stitch which creates a thick three dimensional pile that adds a richness and reality to floral designs. It is a form of turkey work which we occasionally see in the reproduction samplers we love to stitch. BWW was developed in Germany in the 19th century and was based on hand painted cross stitch charts that were worked with a very soft wool that was spun in the city of Saxe-Gotha. The wool was taken to Berlin, where it was dyed in brilliant, large colour palettes. This was possible due to the discovery of aniline dyes. Artists in Berlin soon began to develop charts and classic paintings were copied onto canvas in squares of colour together with original designs of flowers and geometric shapes. “Point” paper (graph paper using 1 square to the inch) was used to show coloured blocks that corresponded to the squares on the canvas. Before this, colours had been shown by codes and patterns that were printed using copper plates. A very expensive process. Now the embroiderer could follow a coloured graph by counting lines, squares, and stitches on a blank canvas. A new canvas was created that had parallel threads crossing at larger intervals, and that innovation was followed by the inclusion of a blue line placed vertically at intervals of 5 or 10 threads to help the stitcher count. The wool used for Berlin work was softer than crewel thread, which was wiry and twisty, and strands of woven crewel thread were very difficult to separate. Berlin wool was manufactured for knitting as well as embroidery. Eventually, Berlin wool was produced in Yorkshire by blending German and English wool. English needleworkers preferred a softer colour palette to the brilliant German colours. BWW became very popular in Victorian England and soon homes were full of durable and long-lived pieces of embroidery that could be used as furniture covers, fire screens, cushions, bags and clothing. Our churches too with the kneelers for the church pews which started my musing on Berlin wool work. To coincide with the London season of fine art and antique fairs commencing 24th June – July 7th 2016, WITNEY ANTIQUES have decided to hold an exhibition of historic samplers in their Oxfordshire showrooms and extend to all a warm welcome. Sunday June 26th 2-5 pm and Monday June 27th to July 17th 2016 from 10am – 5pm daily. A full colour catalogue illustrating around fifty samplers will be available from June 1st 2016. Many of these historic pieces are from private collections and all will be for sale. The exhibition will cut across all levels of society embracing both the affluent and the poor and stands as a testament to the skill and perseverance of the young and their talented teachers. Whether worked with a view to future employment, for pleasure or in order to be the mistress of a large household, they illuminate the lives of girls and young women going back over 300 years. Their stock of rare 17th Century embroidery will also be on view. Admission is free. For those of us attending The Feller Tour on July 6th a visit to the exhibition could easily be combined. One of our favourite needlework books at Hands Across the Sea Samplers is Elizabethan Stitches by Jacqui Carey. Mary Corbet did a wonderful in depth review of the book when it was released in 2012 and described it as one of the “You Definitely Need This” books, whether you’re a fan of historic English needlework or simply a surface embroiderer who is interested in all kinds of stitches and their applications! Here is the link to her review. Living in a remote part of Cornwall on England’s most southerly tip it is rare (rarer than hen’s teeth) for a course to be available and close by that catches Nicola’s attention. She couldn’t believe it when she discovered that not only does Jacqui Carey live in the next County (still a five hour round trip) but she runs courses from her home. Together with some friends Nicola will be attending a course in April on Elizabethan Stitches – she is beyond excited. There is so much that is to be learnt about these stunning stitches from the period. Jacqui Carey’s analysis of old textiles has revealed that ‘modern’ stitches are structurally different to the ones found on late 16th & early 17th century objects. Therefore the techniques used in this era were also different. During the workshop, Jacqui will share her extensive research work by discussing actual examples dating from this period (lots of lovely photographs, but sadly no actual artefacts). Students will learn about the historical context of the embroidery, before trying their hand at some of the stitches, and starting work on their own ‘spot’ sampler. For the historic embroiderer, this was a material ‘sketch book’ that allowed them to test and record ideas. Spot samplers were a visual storehouse of motifs, patterns, ideas, colour ways and stitch textures, and as such were a valued resource. Students who would prefer to work towards a finished product have the option of using their sample stitching as the start of a small item such as a purse or ‘sweet bag’. The workshop will start with an illustrated talk that will set the historical scene. It will include a discussion of the detective work involved in gathering evidence, and the delights and challenges of doing object-based research. Students will then have the opportunity to explore historic design sources, and discover how the embroiderer transferred and interpreted them. Practical work will cover the instruction for several period stitches. These will include some needlepoint, plaited braid stitches, and punto in aria (stitches in air). Students will make a large-scale sample in order to understand the construction of each stitch, before embarking on smaller scale production, as part of a design worked onto their spot sampler, or purse. 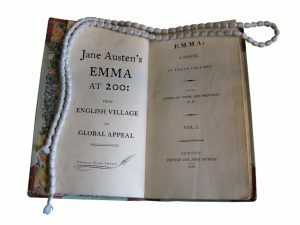 This year is the bicentenary of the publication of Jane Austen’s novel Emma. It was published by John Murray II on 23 December 1815, with 1816 on the title page. In March Chawton House Library will be launching an exhibition to commemorate this landmark in Jane Austen’s publishing career. 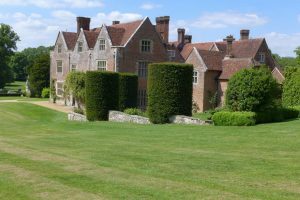 Items from the Chawton collection, and the Knight family collection will be used to talk about the world of the novel and its reception through the nineteenth, twentieth and twenty-first centuries. An entire room of the exhibition is going to be devoted to the topic of female accomplishments – music, painting and, of course, needlework – which readers of the novel will know loom large in this, as in all, Austen’s novels. Embroidery from the Great Lady’s Magazine Stitch Off will be on show at the exhibition. The exhibition runs from 21 March to 25 September 2016. Chawton House Library is an internationally respected research and learning centre for the study of early women’s writing from 1600 to 1830. Access to the library’s unique collection is for the benefit of scholars and the general public alike. Set in the quintessentially English manor house that once belonged to Jane Austen’s brother, Edward. They want to recreate and bring back to life a handful of some of the hundreds of embroidery patterns the Lady’s Magazine (1770-1832) published every month over the course of its 62-year run. They want to learn from your experiences about the challenges and pleasures of ‘work’, as it would have been known at the time, that would have occupied many of the magazine’s readers. We believe the main stitch is Queen or Rococo Stitch rather than Gobelin. At Hands Across the Sea Samplers we love to learn something new every day about embroidery and we eagerly devored an interesting article in Spitalfields Life about the Broderers of St Paul’s Cathedral. If you climb the 141 steps to a windowless chamber high up in a tower of St Paul’s Cathedral you will find The Broderers of St Pauls. The 14 needleworkers are currently busy restoring of a banner of St Barnabas. I have been on the hunt for stainless steel rust proof pins to remount an antique sampler. I have been surprised to find I am struggling to source some in the UK. A search of the internet threw up a very interesting article on the subject of pins that is well worth a read and bookmarking for future reference. Which brand of pins do you recommend for mounting a sampler? Congratulations to Rosella on her beautiful pin cushion using our free cross stitch chart. Hands Across the Sea Samplers have been deeply touched by the support they have received in launching their new venture. Nicola and Sandra want to thank every one of you and we have a small thank you gift for you to enjoy. We have received so many emails from old friends and new, from all over the world, offering congratulations and good wishes. We have been grateful too for the selfless support and promotion given by other designers who have guided us in the complexities of the market and offered wise words of advice. Barbara Hutson of Queenstown Samplers, Jackie du Plessis of Fine-ally Finished, Pam Schmidt of Prairie Sampler, Ellen Chester of With Thy Needle and Thread, Carmen Sutton of Cardan Antiques and Needlework, Moira Blackburn, Tanya Renner Brockmeyer of The Scarlet House and Melinda Cole of Merrywind Farm. Together with Jean Lea of The Attic and Joy Jarrett of Witney Antiques who have also guided us. Their generosity of spirit is greatly appreciated. Most of all we would like to say a HUGE THANK YOU to all of those who have purchased and stocked our first design – Miss Mary Ann Bournes. When putting together our designs and charts we have tried to make them unique and to do so from a stitcher’s point of view. We have taken features we love from charts we have enjoyed working from, added a few extras and got creative with our artwork to make our charts little gems to collect and cherish. We are very open to input from our stitchers so please let us know if you would like to see any other features to make the charts even more enjoyable to work with. Very soon we will be releasing our second chart and as a thank you to all our supporters we have a free chart of a sweet motif taken from this sampler; it would be ideal for a bookmark. Click HERE to download. This stitch is no different to any other so don’t panic or dismiss trying it. Practice will help you understand the mechanics of the stitch. Then you will fall into its rhythm and be able to perfect your tension. Tension is important – it is easy to work it too tightly or too loosely. Practice on a doodle cloth until you feel comfortable. Let’s look at a symmetrical shape to practice with. An acorn cup is a good one. The first step is to stitch out the shape of the acorn cup using double running or back stitch. I have used double running. Without piercing the fabric go under the first double running stitch and under the trailing thread. Go over the the loop of your working thread and pull gently. This completes the first button hole stitch. Repeat through each double running stitch until the row is complete. I found it useful to use my needle to prevent pulling the thread too tight and maintain an even tension across the motif. Ensure you include the last double running stitch. Take the thread down under the fabric here. Repeat the whole process again starting with laying another trailing thread. Lay the last trailing thread. Anchor the last row by taking your needle not only under the buttonhole loop, the trailing thread but also under the double running stitch. From the back of the fabric you can see that the fabric has not been pierced by the detached buttonhole stitches. Let us look at a more complicated shape- a flower. I began by outlining the first petal in double running stitch. Then started to stitch the rows of detached buttonhole in the right hand tip. Don’t worry too much how the row looks as you stitch it. When adding the following row you will see the prior row take shape. Have confidence in your work – see how the same rows look in the photo above and then the photo below. Cast on extra stitches as you work across so that there is room to add padding to the petal to give it shape. I used ends of thread (ORTS) of the same colour, scrunched up and pushed under the stitching before the last row was stitched and then secured the petal by anchoring down the last row. I then worked the petals either side of the first one, followed by the fourth, then finally the centre. Please excuse the lines on this photo. I used a Mill Hill petite bead to pad the petals of the little flower as they were too small to pad with thread. Detached Buttonhole Filling can be used to create wonderful textures and add dimension to your work. The same flower has been stitched above in satin stitch and detached buttonhole filling. 1 & 2 are acorn cups using the shape we practiced with above. The leaf marked at 3 has been padded and the leaf at 4 has no padding. Have fun experimenting with this stitch. Australia has given a very warm welcome to our first reproduction – Miss Mary Ann Bournes 1791. A group of happy ladies attending this Years Patchwork Summer School in Blackheath, Blue Mountains in Australia with Linen and Threads. At Hands Across the Sea Samplers we have all hands on deck and are busy stitching and charting. An English sampler with a very interesting border is currently being stitched by Suzanne who does the most exquisite needlework. This colourful sampler is a REALLY BIG GIRL who is going to look fabulous on your sampler wall. She is due for release towards the end of the summer but we will share some more peaks as she grows. A visit to the Crewel Gobelin in Sydney, Australia. Hands Across the Sea Samplers were privileged yesterday to visit The Crewel Gobelin in Sydney which is a beautiful store jam packed with goodies to delight the most discerning of stitchers in Australia. Representing H.A.T.S were Sandra one of our designers and Suzanne, a very talented embroiderer who model stitches for us. Sandra enjoyed the afternoon meeting a lovely group of samplers lovers, answering questions about our new release Miss Mary Ann Bournes 1791 and autographing her chart. The ladies attending were thrilled to see the models of three other designs being released in 2016 but don’t worry we will be sharing some photos with all our customers over the next few weeks. Many stitchers are now kitting up Miss Mary Ann Bournes 1791 and although the model was stitched with AVAS on Lakeside Linen Sand Dune she will look just as beautiful stitched in DMC. We thought it would help in deciding if we showed the model with the DMC colours laid over.